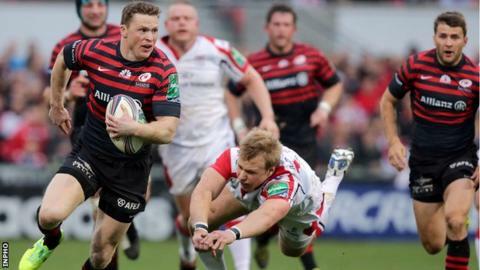 Saracens won a pulsating match against 14-man Ulster to clinch a place in the semi-finals of the Heineken Cup. Ulster full-back Jared Payne was sent off for a dangerous tackle on opposite number Alex Goode in the fifth minute. Winger Chris Ashton scored the only try of the first half but three penalties by Ruan Pienaar saw Ulster lead 9-5. Second-half tries by Mouritz Botha and Ashton put Saracens 17-9 ahead and Paddy Jackson's two late penalties were not enough for the brave hosts. Saracens now play Clermont in the semi-finals at Twickenham and, having come through this tough test in front of a partisan Belfast crowd, the London team will believe they can go all the way. Ravenhill, with a brand new stand bringing the capacity up to 18,000, was bouncing and expectations of a memorable Ulster triumph were high. But barely five minutes had been played when Payne's dangerous challenge on the airborne Goode resulted in the game's big talking point. As the Sarries full-back was receiving medical attention, referee Jerome Garces was watching a series of video replays of the incident. He finally decided it was a red card for a reckless tackle on a man who was in the air. Predictably, the verdict was greeted with deafening boos from the passionate home support, and things subsequently got worse for Ulster with injuries to key men Rory Best and Pienaar. Influential scrum-half Pienaar suffered a recurrence of the shoulder injury he sustained in a Pro12 win over Scarlets on 14 March but the South African battled on, while Best hobbled off and was replaced by Rob Herring. Despite these setbacks, Pienaar landed two penalties before Saracens got their first try in the 23rd minute. It came from a solid scrum, with Ashton taking an inside pass to run 45 metres to the line before diving over in the right corner. Owen Farrell, who had missed a third-minute penalty, was again off target with the conversion attempt. Ulster regained the lead on the half hour with a Pienaar penalty. The injured scrum-half then missed a penalty from his own team's half, but landed his third of the game with the final kick of the half to give the Irish province a 9-5 lead. It was quite an achievement for Ulster to be four points up at the turnaround, but the injuries - and the effort of facing the Premiership leaders with just 14 men - would eventually take their toll. Saracens, coached by former Ulster back Mark McCall, regained the lead when good vision by Richard Wigglesworth allowed Botha to score on the right wing, although Farrell was again off target with the conversion attempt. Playmaker Pienaar had to be replaced by Paul Marshall and Ulster also brought on flanker Stephen Ferris, who recently returned to action after long-term injury. Fly-half Paddy Jackson, taking on the kicking duties, hit an upright with a penalty while Farrell's goal-kicking nightmare continued with a fourth missed attempt at the posts. Saracens scored what proved to be the match-winning try in the 67th minute, Ashton collecting Farrell's pinpoint crosskick to touch down in the right corner. That took Ashton on to nine Heineken Cup tries for the season, equalling Matthew Robinson's record. This time Farrell got the conversion and the English side were 17-9 to the good. However, indiscipline almost cost Saracens as Jackson landed two penalties to leave just two points in it as the hosts, inspired by their fans, dug deep. Ulster launched a late push, going through more than 30 phases as the game entered stoppage-time, but Saracens refused to give ground and secured the narrow victory. Saracens captain Steve Borthwick: "The red card is up to the referee, we just have to deal with whatever he decides. "We gave too many penalties away and that gave Ulster opportunities at goal. "In the second half we played very well and managed to keep some sustained pressure on them." "It's obviously dangerous, but a yellow card would have been right." Ulster: J Payne, A Trimble, D Cave, L Marshall, T Bowe, P Jackson, R Pienaar, T Court, R Best, J Afoa, J Muller (capt), D Tuohy, R Wilson, N Williams, C Henry. Replacements: Gilroy for Trimble (65), P Marshall for Pienaar (50), Herring for Best (13), Diack for Muller (69), Henderson for Tuohy (60), Ferris for Williams (55). Not used: Warwick, R Lutton. Saracens: A Goode, C Ashton, D Taylor, B Barritt, D Strettle, O Farrell, R Wigglesworth, M Vunipola, S Brits, J Johnston, S Borthwick (capt), M Botha, B Vunipola, J Burger, E Joubert. Replacements: Wyles for Goode (5), Hodgson for Taylor (11), de Kock for Wigglesworth (69), Stevens for Johnston (48), Brown for Joubert (65). Not used: George, Barrington, Sheriff.